Consumers are becoming increasingly environmentally conscious. However, hardly anyone is willing to do without comfort and convenience. Lenzing offers sustainable solutions on a global scale with fibers made of the renewable raw material wood. 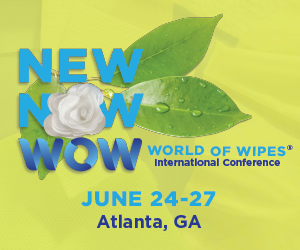 Companies from the worldwide nonwovens industry will gather at the IDEA trade show in Miami, USA from April 23-25, 2013. Consumers continue to keep a very close eye on the development of sustainable products, which in turn influences purchasing decisions along the entire supply chain. Manufacturers deciding in favor of Lenzing fibers as a raw material enable consumers to source products which combine performance, comfort and ecological responsibility from the very beginning. For three days IDEA will serve as the central focal point and meeting place for the entire nonwovens supply chain. The trade fair will feature more than 375 exhibitors from 70 countries and an expected expert audience of more than 6,000 visitors. “IDEA is a global trade fair. In Miami we will meet all our direct and indirect customers along the value chain”, says Elisabeth Stanger, Global Marketing Director. “In this way we familiarize ourselves even more with customer requirements, and can demonstrate our innovative strength by providing tailored solutions”, she adds. Extensive demands are placed on the top layer of women’s hygiene products. Liquids should be quickly absorbed, with minimal release to the skin in order to ensure a comfortable and dry feeling when using these products. TENCEL®Biosoft exceeds these demands by creating a botanic added value. It transforms the renewable raw material wood into an environmentally compatible end product. The Lenzing team looks forward to your visit to the IDEA trade fair booth no. 1801. The Lenzing Group is a world market leader with headquarters in Austria, production sites in all major markets as well as a worldwide network of sales and marketing offices. Lenzing supplies the global textile and nonwovens industry with high-quality man-made cellulose fibers and is the leading supplier in many business-to-business markets. The portfolio ranges from dissolving pulp, standard and specialty cellulose fibers to high-quality plastic polymer products and engineering services. Lenzing quality and innovative strength set global standards for man-made cellulose fibers. With more than 70 years of experience in fiber production, the Lenzing Group is the only company worldwide combining the manufacturing of all three man-made cellulose fiber generations on a large industrial scale under one roof – from the classic viscose to modal and lyocell (TENCEL®) fibers. The success of the Lenzing Group is based on a unique combination of consistent customer orientation together with its leadership in innovation, technology and quality. Our successful specialization strategy and an outstanding cost position are the basis for our economic strength. Lenzing is committed to the principle of sustainable management and very high environmental standards. Lenzing’s core business fibers is complemented by our activities in the business fields plastics and engineering.